1 Br, 1 Ba Guesthouse, Sleeps 4, Located 1/2 mile from Beach & Restaurants, etc. We have lived on the Beautiful Gulf Coast of Mississippi for the since 2005 and now call this home. We fell in love with Waveland/Bay St. Louis Area and could not imagine living any where else. We are located within 1/2 mile from the beach, shopping, restaurants, grocery stores, nightlife and more. We offer you and you guest a location with gardens, pool and coastal living. Our Home has been featured in several Magazines on the Coast, 2 tour of homes. It was built in 2006 after Hurricane Katrina destroyed the home that was originally there. Breezy Porches got its name from some friends sitting on the porch and made the comment that no matter where you sit you get a breeze. You should call it "Breezy Porches". We can accommodate up to (4) four people with sleeping quarters. We provide the towels for the Guesthouse only. Please bring any beach towels you may need to go to beach. Set of Dishware, Glassware, Silverware and cooking utensils. We are located within minutes to Park that rents Canoes for the day for $25.00. if interested, inquire with us and we can give you the information. 8' x 12' Patio area. I am Sorry, but we are NOT Wheelchair Accessible. 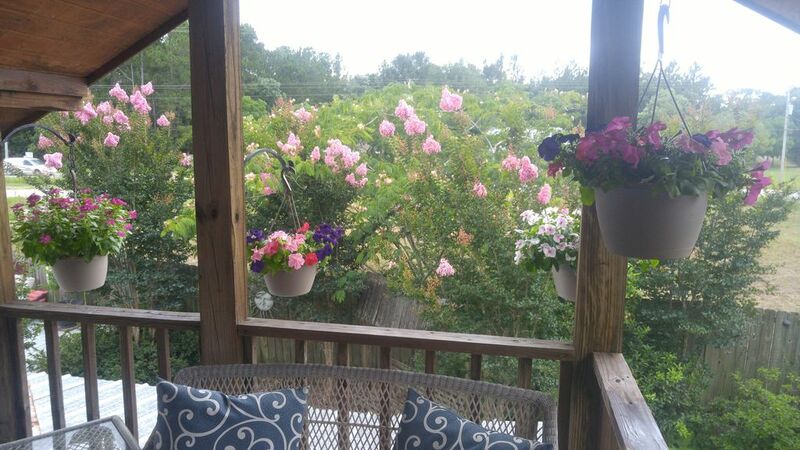 Perfect spot to enjoy the charm and relaxation of the gulf coast area. Easy to locate and close to beaches and restaurants. The owners bring a whole new meaning to southern hospitality. I hated to leave this little piece of paradise and can't wait to return again. Donna was truly the prefect guest. We saw her a couple time out and about during her stay. She communicates well, very clean & follows the house rules. Donna is welcome to come stay with us anytime she wants. Thank you Donna! Perfect little place to stay! We were in town for a wedding. It was a perfect little place to stay for the two of us. Close to the beach yet still closing to dining options & stores. The house is lovely and was the perfect place for our family to stay while spending a long weekend at the beach and Buccaneer State Park. Plenty of room for our group, and the wrap around porch really makes it feel like home. We really loved the little zen fountain area in the beautiful garden surrounding the house. Tip: Don't miss out on visiting the unique little shop across the street. You will love their homemade candles as much as we did! Would definitely recommend Breezy Porches Guesthouse for a stay close to the beaches on the Gulf Coast. The home was very beautiful and our host was very friendly and accomodating. Pictures don't do it justice, you really need to see it. Very close to several casinos if that is what you are going for. Looking forward to going back in the future and staying there. We are so glad you and your sister & husbands all enjoyed your stay here with us at Breezy Porches Guesthouse. We really enjoyed meeting all of you and Welcome you all back with Open Arms. We absolutely loved staying here! It is so relaxing and conveniently located to everything! Perfect vacation! We can't wait to go back! Thank you Toni, We enjoyed meeting your family and so happy you enjoyed your stay with us. We are happy you selected Breezy Porches Guesthouse as your Vacation Getaway. Rates are subject to change until reservations is booked.